I started reading the papers from the Kansas City Fed Jackson Hole conference. This annual meeting of central bankers and economists has become a must read for getting the pulse of current thinking by the Fed. This year's theme, called "Maintaining stability in a changing financial system", is no exception. The set of papers is an economist's view of the credit crisis the work provides a good mix of theory and practical analysis of the events surrounding the crisis. However, the reading makes for a grim history of policy mistakes and financial structure which has lead to a serious financial problem today. As one author states, this was the "panic of 2007" and is in the same context as the great panic of 100 years prior in 1907. The tragedy is that the foundation for the crisis was clearly evident through the actions of the key players in the financial markets. This crisis was an a result of some economic shock that hit the housing market but a a combination of incentives and structures coupled with loose monetary policies that lead to greater risk taking than should have occurred. Shame on the government not for doing too little after the crisis began but setting up an environment where the excesses could have occurred. This has less to do with lending practices at the point where the mortgages were originated and more to do with an environment that allowed the mispricing of risk. The cost of mispricing risk will take years to clean-up. Recent comments from the ECB suggest that there is still a central focus on inflaiton. The bank's inflation forecast for the next year will be aroud 3% which is higher than their target of 2%. All of the central bank's talk is centered on a policy that will do everything to bring this number down to the target; consequently, we are not going to see any decline in rates over the near-term. Their creditability is intact, but it will come at a high price. Without lowering rates, there will be no help on the real economy from the ECB. The only way that rates will fall will be from a redcued demand pressure from a recession. The Euroland economy is only going to further languish, so there is little reason to see any upset for equities or the euro over the near-term. We will have to wait until the second half of the year for the bad economic numbers or that at least that is what economists are telling us. After the advanced estimates for the second quarter GDP numbers showed 1.9% growth, the second quarter growth actually came out with a 3.3% increase beating survey estimates. Where is the recession? We thought we knew the recession was out there given the real estate and housing numbers, but the rest of the economy has been doing better than expected with exports leading the way. The focus has been on the tax rebate boost, but even accounting for that stimulus growth has been good. Some of the growth came at the expense of corporate profits which have been hurt by price cutting but the US economy is behaving in a manner not expected. There is growing unemployment, falling confidence, housing fears, financial dislocations, credit cutbacks but positive GDP growth higher than reported for the first quarter. Equities and the dollar will get a boost but we will have to wait for bad GDP news. Everyone says it is coming. Never bet against a credit crunch, but the slowdown should have been more dramatic. The US economy is showing some signs of not willing to fall off a cliff. Total new orders for durable goods was up 1.3 %, the same as last month and higher than expectations. This is the highest we have seen this year and the first back to back positive months above 1% since April-March 2007. The ex-defense new orders were up 2.8% which is a good sign that the growth is coming from the private sector. Nondefense capital goods was up 6.3% which was another good sign. The higher than expected durable goods numbers contrast with the decline in IFO expectations in Germany which showed an unexpected decrease. Both the business climate and current assessments came in lower than expected. All of the second quarter numbers for Germany came in negative except for government spending and consumer confidence is falling. The growth differential plays to the current trend in dollar appreciation. Without any action from the monetary side to help the economy, this economic and dollar trend will continue. Tax policy and deficits will be two of the most important presidential issues over the next four years. The Bush tax cuts will roll-off. The Federal deficit continues to rise, so there is a need for greater revenue or a cut in spending if there is a desire to rein in financing. However, given the current recessionary environment, it is unlikely that we will see a decline in government spending. Hence there will be a need for more revenue just to keep deficits at current levels. There are also difficulties on the revenue side of the government equation because if economic growth is slowing there will be less tax receipts as the economy shrinks. Now one response could be that deficits do not matter. There is no crowding out or rise in interest rates. The relationship between deficits and interest rates empirically has been up for dispute. However, there is the additional issue that more of the deficit is held in the hands of foreign government. We are not in a closed financial system. This financing has been a gain for the US because we could borrow to enhance our own standard of living but there will be a point where we send more and more cash flow to non-US investors. The issue with tax policy is that it is not about just raising revenue and promoting growth. Most of the discussion is not about those two objectives but about the equity of the tax system. Who is paying and how much. This is where the discussion get political and seem to move away from analysis of the data. The graphs from the IRS provide an interesting point of view on tax policy. 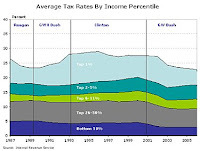 The first graph looks at the average tax rate for an number of income percentiles. All of the income percentiles show declines in the average tax rate. The tables shows the average progressivity of the tax system. The bottom 50% of income pays a rate less than 5% while the top 1% pays about 22.5%. The average rates are not as high as the marginal rates but clearly higher income tax-payers pay a higher as a percentage of their income. 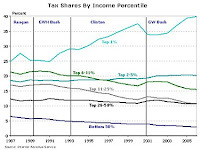 The second graph shows the tax shares as percentage of the income percentile. The top 1% of the taxpayers pay about 40% of all income taxes. The top 10% of taxpayers represent 75% of all of the income taxes paid. The payment of taxes falls to those who are producing the most economic value as measured by income. Is this a "fair" system? How much is appropriate for each of these group? If there is a 5% shift of the tax burden, would we feel the system is then fair? Is this the most efficient system at raising the most tax revenue? For the majority, it clearly has not been a disproportional burden; however, since the marginal propensity to consume is always higher at lower income any taxes will have a a greater impact on consumption for the middle class. If this is the measure of fairness, then at the extreme we should move all of the taxes to the wealthiest tax-payers because more of their spending is on disposable consumption. If the question is put to a vote, the result would be simple, higher taxes on the few as imposed by the many. Does that work? The answers are not easy but the impact could be large if there is longer-term slowdown of economic growth. One of the easiest ways to get currency exposure in a portfolio is through investing in international equities. This has been a windfall for investors for the last few years because the dollar has depreciated by over 40% since 2001. When the dollar direction turns, all of those international stocks will be worth less once they are converted into dollars. All of the European stock indices have underperformed the US in their home currency and in dollars. The currency adjustment has actually been neutral for many of the indices so that the effects of the current dollar rally have been negligible. The impact has been much greater in the emerging markets where there has been a greater difference in the home versus dollar returns. In Latin America, dollar adjusted stock indices have done better tan local returns. Eastern Europe has more closely matched the other indices of the EU while Asian markets have shown more deterioration. There will be less free lunch for international equity investors in 2008 so that the simple judgement of leaving currency exposure unhedged may not pay-off. Bloomberg calculates for a large number of countries the misery index which is the combination of the the inflation and unemployment rate. Out of the 57 ccountries tested, 52 or 91% of the countries have misery levels which are at the same or higher than last year. Only five countries have seen decreases in their numbers. The low for switzerland at a combination of 5.4%. The high is in Venezuela at 41.3%. The nex highest is in South Africa at 35.2% through a combinaiton of 12% inflation and 23% unemployment. We don't expect these numbers to fall by year-end. There may be a slight decline in inflation from the fall in commodity prices but we should see an increase in unemployment over the same period. The world economies are starting to move together. One year after the credit crisis began lending conditions have only gotten worse not better from looking at the survey of senior credit officers. We are at higher percentages for both the number of credit officers who see tightening credit conditions and an increase in spread on loan rates from large and medium institutions. The message is clear. Banks are making it harder for anyone to get credit and if they do decide to give you some money, it will be at more expensive terms. The terms are worse than the last recession and the tightening is on par with the 2000 recession. Regardless o what the Fed is doing money is not leaving the banks. This will show up in a lower velocity of money. Even if the money supply is growing faster, you can still have a restrictive monetary policy if the money is not being used to stimulate the economy. There is not going to be an quick economic turnaround if the credit officers are holding tight to their loanable funds. Ken Rogoff, Harvard professor, leading international finance economist and former chief economist for the IMF is one pessimistic forecaster. He comments about large potential bank failures. We have to see more consolidation in the financial sector before this is over…Probably Fannie Mae and Freddie Mac — despite what U.S. Treasury Secretary Hank Paulson said — these giant mortgage guarantee agencies are not going to exist in their present form in a few years." However, his pessimism may be well-placed. Prof. Rogoff has researched banking and currency crises so he is familiar with the numbers. A close study of banking and currency crises usually suggests that failures of large institutions is not out of the question and actually is the norm. When there is a systemic crisis in a lending area such as housing, it is highly unlikely that a large institutions will be able to avoid the risks. Even if a large bank's lending portfolio in this area is smaller, the power of leverage tells us that it takes a lot of good loans to make up for a few bad ones. Or put more bluntly, lending within a sector may outstrip the capital of even large firms. Similar firms that may have less diversification are at even more risk. There is no easy way out of these crises and they have taken years to solve. The solution often entails nationalization of some portion of the banking system. The talk about a Freddie and Fannie bail-out is a form of bank nationalization. The biggest problem with a banking crisis is the ongoing cutback on lending to good institutions. The reduction in leverage means that the the failure will have a ripple effect to many good parts of the economy. Any failure in the United States will lead not only to an equity sell-off but to a reversal of the current dollar rally. Looking at the inflation numbers across time provides some interesting relationships that should be kept in mind as the talk of stagflation heats up. 1. Inflation is a lagging indicator relative to the business cycle and does not peak until the economy is well in recession. This relationship may not change with this recession. This peaking may be related to recessions being associated with supply shocks. All recessions have been preceded by a an oil price shock. Of course, there have been some price shocks which did not lead to recession but the current environment is holding true to form. The idea of stagflation has to be given a clearer definition. Just because inflation will peak during a recession does not mean that we have stagflation. 2. The link between CPI and Core CPI has changed and now has a lower correlation. The core CPI ex food and energy has been surprisingly steady which means that the commodity shocks has not translated to prices in other areas of the economy. This may be due to the globalization effect, but as we see more inflation in the emerging market countries, especially China, there should be an increase in costs in the US. There has not been the wage price spiral that we have seen in the 1970's during this run-up in prices. 3. Link between CPI and PPI is not as strong as previous periods. Usually the correlation has been extremely high especially during the 1970's. Part of this change reflects the mix in the economy to more services. However, there has been a shift in the PPI and CPI relationship. For most of the 1990's, PPI was often lower than CPI. Over the last three years, there has been a shift with PPI increases leading CPI and having a much larger gap between the two inflation measures. 4. Wage rates have not moved with CPI. There has not been as close a link between wages and CPI. Hence there has been a fall in real wages in the US that has not matched by the increases in productivity. The decline in wages will place a drag on consumer spending. The current movement in inflation is showing some unique features and may not fit within a specific historical period. International economies coupled or decoupled? One of the largest questions in macroeconomics and for investments in the last few years has been whether global economies have been decoupled. It was the idea of decoupling which has driven much of the international equity diversification. If there is not a link with the US, you can invest in other countries without the fear that US slowdown will take down the rest of the world. You would be willing to sacrifice liquidity for the diversification advantage. The problem with answering the decoupling question empirically rests on four difficult issues. One, there are not many recessions so the data available to test whether there is coupling is limited to a few events. The US has only had two recessions since 1990. Abstracting from a small sample of slowdowns makes it difficult to determine whether there is any meaningful relationship. Two, working with macroeconomic time series is difficult. Assume that there is a US recession and nine months later there is a downturn in Europe. Would that be considered a coupled event? Would the answer change if the time difference was 18 months? How much time between events is necessary before there is a decoupling? Three, the world has changed. With an increase in trade, there is a greater link across economies so the degree of coupling will be different than 25 years ago. There is a greater likelihood that any event may be transferred across countries either on the trade side or on the financial side. However, this is different from the old adage that if the US sneezes the rest of the world catches a cold. A quarter a century ago the US represented a greater portion of world output so any event in the US would have a greater world impact. World production is more diverse today but the links across countries via globalization are greater. Four, the very definition of what would be a coupled event is hard to define. Some recessions will be localized. The Mexican crisis in 1994 would be a simple albeit large localized event. The discussion of coupling have to be discussed in the context of macro factors that can be transmitted across region. This, by definition, will reduce the number of coupled events. Taking note of these issues suggests that we have a coupled event currently: a single risk factor from a credit contraction; a commodity price shock; timing of a slowdown across regions within a nine month time frame; and an event that is affecting trade flows. Coupling of economic events was never dead, we just needed the right set of circumstances. With Euroland GDP turning negative and the dollar strengthening, an obvious question is how come the headline risk of the US economy has not been captured in the GDP numbers. Second quarter GDP was 1.9%. This is slower and the fourth quarter 2007 was revised to negative, but this is not a recession by the definition of two negative GDP quarters. The US economy is supposed to be ill, yet like a good medical practice the US has done a better job of helping the sick patient. The help was available because there are less constraints on the US economy to engage in old time Keynesian “pump-priming". Given medicine to make you better is not a cure, but it helps relieve some of the pain. The medicine for the US economy has been a responsive monetary policy which has dropped rates from 5.25% to 2%. In addition, the Fed has allowed for flexible lending facilities for both banks and brokerage firms. It has also taken the lead to reduce systematic financial risk through the sale of Bear Stearns to JP Morgan. The Treasury has taken the lead to provide some solutions for the housing mess and the GSE debacle. Congress passed a housing bill to provide emergency funds for housing. The President offered tax rebate program that added to second quarter GDP. The response in Europe has been less aggressive. The ECB has not lowered rates and has focused only on inflation fighting. granted there has been an increase in some lending facilities but there has not been a clear objective for trying to grow EU economies. The fiscal side has not had the same level of aggressive action as in the US. Hence there has been a slide in European growth as many of the same credit and housing issues are taking a bite into the economy. Europe is less flexible in their potential policy responses to a recession. There may be a better safety net for workers, but the likelihood of stronger European growth to drive the rest of the G7 is not likely. The dollar strength is less liely to be reversed in this type of environment. CPI came out today above expectations and there was no real reaction. Inflation is now at the highest levels in 17 years and the bond market rallied. The dollar was in a tight range and equities increased. Some announcement. Core inflation is still half of the headline number. Oil and food prices have seen strong declines so maybe everyone is just looking through the July number; nevertheless, the current misery index of inflation and unemployment is only moving higher. Japan was also hit with the highest inflation in decades with their domestic corporate goods index. While the index has seem some spikes, the current run-up is part of a sustained trend. We looked at the series back to 1980 and could not find a similar sustained spike. This is truly a surprise given the deflation decade of the 1990's. The real surprise is the lack of further follow-through on fixed income. Break-even inflation rates in the US are still at 2%. In Japan, the break-even yields on 2018 maturities is at .182. Still is still complacent. I am a business news junkie, so I have been a diligent reader about all the news on the credit crisis over the last year. Like most investors I have turned negative on the US economy. The evidence has been mounting that the US was is and will be in a recession, yet looking at the data now shows a different story. The US is the only G7 economy that has been growing above 1%. UK was an anemic .2 % for the second quarter while the rest of the G7 are posting negative numbers. Note that the other G7 economies except for Japan have have started a lower growth levels. No wonder the dollar has been on a rally. The rest of the world is worse off than the US. While we have all been focusing on the housing crisis the rest of the world slipped into negative growth. There could be an explanation for this based on short-term stimulus. The US economy has been boosted with tax rebates in the second quarter and the Fed has been aggressive at cutting rates. Perhaps the US policies have just delayed the slowdown which should have happened earlier in the year. The facts appear that the rest of the developed world is doing worse off. This relative growth difference gives a better explanation for why the rest of the G7 stock markets have done worse than the US. The exception is Canada which has been helped by its energy focus. Tracking business cycles is often the key to timing markets and these numbers provide a good explanation for the dollar current strength, but if the US just delayed what is happening in the rest of the world we can expect some bad relative news in US equities and the dollar in the last quarter. One month after the Fed admitted that growth was going to be slow in the US, Bank of England Governor Mervyn King announced a cut in their growth forecasts, but the the negative impact was immediate. His language was extremely negative, "It may still be summer but there is a chill in the economic air". "The economy faces a difficult and and painful adjustment that cannot be avoided." England is facing a worse combination of slower growth and higher inflation than the US and certainly is doing worse than the Eurozone. The stagflation scenario is real in England. The recent decline in commodities may slow the inflation side of the problem but the housing market may be in worse shape. Great Britain has not been as pro-active in trying to provide a housing solution and the Bank of England has not been as aggressive as the Fed with providing funds for banks even though M4 money supply is growing at double digits. Retail sales have turned negative in the last month and industrial production is negative yoy. No wonder the pound is at 22 month lows. It is not that the US is looking so good but rather that places like Great Britain are turning into major economic problems. From my friend Marty Fridson at Fridson Investment Advisors. The quality of data is suspect for many macroeconomic series. We use it but sometimes have to hold our noses; nevertheless, it may in some cases be the only guide we have to tel us the general direction of growth or inflation. While some have been arguing the end of the carry trade, the real end-game in currency trading is the commodity run. Three currencies which have seen some of the biggest reversals are AUD, NZD and CAD all of which are key commodity currencies. NOK and ZAR have also seen big reversals since the beginning of the month. It happens that these currencies have had higher interest rates than the US which made them likely carry currencies but the driver is more the price of oil as the terms of trade adjust rapidly to the change in crude oil prices. Canada has been hit with the combination of lower energy prices and the close ties to the US economy. More exports are in the manufacturing sector especially in auto parts, so the slowdown in the US auto industry has hit the CAD hard once the benefit of high crude was taken away. Once the benefit of high commodity price was taken away, Australia was also hit hard. There was little benefit in the metals area with the slowdown in economic growth in China. Even a relatively strong economy like Norway has seen a sizable reversal. There is little chance we will see these currencies reach their pre-July levels anytime soon so we should get used to the new trading levels. Russia has invaded Georgia which is a vital area for oil pipelines from the Caspian Sea. The potential disruption if the pipelines are cut is significant, yet oil prices have fallen over the last few days. This seems odd after all of the big price moves associated with geopolitical risk in the Middle East. Of course, the size of the problem in the Middle East is much larger but we have had strong reaction in oil prices from Nigerian terrorists, hurricanes and refinery black-outs, so a war in the vicinity of major pipelines seems to be a no brainer in the geopolitical spectrum. The plan of EU peace talks will be too little too late given how fast the situation is changing. More important than this specific event is the geopolitical risk of Russia using its power or sphere of influence to all of the lands that used to be controlled by the Soviet Union. Russia is flexing its muscles and that means greater control over key commodities needed by the world. Through controlling oil and natural gas flow to Europe and grain trading with the rest of the world, Russia is asserting itself in ways we have not seen in the last fifteen years. Europe at this time is doing nothing and America is unable to take any action. Russia is able to do what it wants, when it wants without much reaction. This geopolitical change goes beyond the impact on prices in commodities affects spending plans in the future because the peace dividend of the cold war will be over and many countries will have to arm themselves to be prepared for this type aggressive future. The world is becoming a more dangerous place just when we are facing greater economic risks. Crude oil prices have fallen off a cliff. Metals prices are down hard and grain markets are more than one third off of their highs. What causes all of these markets to turn at the same time? A look at correlations across the commodities markets shows that there has not been a strong correlation between many of these markets so the swift change in prices has to do with a common factor across all of these markets. The common factor for a decline in all of these markets is not hard to find, a global recession. The issue is why there was such a large change in a matter of weeks? Even if you believe that the common growth factor was the cause for the price decline, it is then less clear why there was such a run-up in prices since the beginning the year. Either the current decline does not make sense or the run-up does not make sense. The common factor view cannot explain both without some mental gymnastics. The mental exercise requires that all of the investors who owned commodities changed their view of global growth in mid-July.The rational story is that investors believed that world growth would continue in spite of the credit crisis in the US or that the credit crisis was not viewed as a significant problem. The current decline is a common view that all investors now believe there will be a global slowdown. Another explanation could be price pressure from everyone moving from equities into commodities and now out again. Call it a herd behavior or a cascade of changes. We live in a non-linear world. These explanations are flawed based on the simple forecasting criteria that a good explanation or model will have some predictive power. The change in expectations story is descriptive but not predictive because we cannot say what are the conditions that will lead to the next run-up or decline. The stories seems to be unique descriptions of the current state of the market and not something that can tell what will happen next time. An explanation for the abrupt change could be created from complexity theory but again we are only left with the conclusions that these types of rapid changes can occur not when or how they will occur. The only hope for investors is to create an exit strategy for every trade that is undertaken. Riding a momentum wave is filled with peril regardless of your power or intellect. I am reminded of the comment of former Citigroup CEO Charlie Prince who said during the height of the credit bubble, "as along as the music is playing, you've got to get up and dance. We are still dancing". We now know the risks of dancing to the wrong tune if the record skips a beat. Why isn't savings a hot topic? The fiscal deficit is going to be over $450 billion and could get worse. The capital account is improving slightly but the debt we produce has to be bought by foreign interests.The Chinese are the key financiers of the US deficit. We are in a recession with tax rebates propping up the economy yet no one is discussing the issue of savings. I just finished the book, Whatever Happened to Thrift? : Why Americans Don't Save and What to do About It? 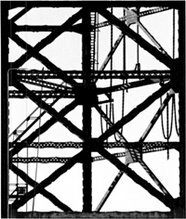 by Ronald Wilcox. It was a good introduction to the savings issue and potential solutions to get Americans to save more, but you come away from analyzing this issue with the belief that there are no quick fixes. Explaining the lack of savings still requires a lot of work. The relative income hypothesis and the idea that credit has been socialized are good explanations but cannot provide a reason for why other countries still have higher savings even when they are provided a greater retirement safety net. The US cultural phenomena of being a consumer society is deeply rooted and seems to be a uniquely American ideal. The incentive structures that can be used to increase savings involve changes in tax policy that would be significant by US standards. The solution lies in taxing consumption so there is a a desire to save. A consumption tax is very far afield form what any presidential candidate s thinking. Yet, tax reform cannot be fully discussed without bringing in the savings issue. The most obvious way to provide for more savings is to provide incentives, tax breaks for those who do save. Unfortunately, those are the people who have more money! In the short-run, it is at odds with the objectives of other policies to provide tax breaks for the less wealthy and hit the higher income brackets. We need a change in tax structure to allow for more savings but we will have to see the problem get worse before some meaningful change is presented to Americans. August is supposed to be a slow month for currency markets with most of Europe on vacation, but the breakout of the dollar so far this month is making for a more exciting August. The euro is at a five month low and the pound is at a 17 month low. AUD and NZD have also fallen markedly. The dollar rally is across the board. Much of this move is a response to the ECB president's simple words that economic growth is "particularly weak". While the US is ahead of the curve on a slowdown, the focus is now on Europe which has not seen the slowdown to the same degree in the economic numbers. The focus has moved from the higher interest rate differential to a story on economic growth. This is at the same time that rates were held constant and consistent with expectations from survey data. With the slowdown in growth, the focus in on the one-way bet that rates will not move any higher. So how bad is the European economy? The numbers are clearly moving in the wrong direction. Euro-zone confidence has plunged since last summer. Unemployment is moving up slightly but like the US this is a lagging indicator. Retail sales have fallen 3% yoy and the business climate indicator has moved into negative territory. The PMI services and retail indicators both have moved below 50 which is a sign of a slowdown. The problem is that there are limited mechanisms for changing this direction in the short-run if the ECB is on hold. The Fed and the federal government through the tax rebate in the second quarter have been more responsive to growth issues. We have argued that the Fed is frozen and cannot raise rates. Now the ECB may be frozen and cannot lower rates. Businesses and consumers will drive these markets through their behavior in the next few months. What is happening to energy prices? The decline in crude oil prices has been as amazing as the run-up and does not seem to have found a level. Natural gas has also been on a sharp decline which is nothing short of falling off a cliff. Part of the explanation is a simple demand story or as the pundits have been calling it, "demand destruction". The price increases have caused a change in behavior of buyers. The demand in the US for gasoline is down over 3% from a year ago. There also has been an increase in subsidized prices in some countries which is biting into demand. An income effect is also present with slower economic growth leading to lower income and a cut-back in overall energy demand. Nevertheless, the sharp change in price seems more exaggerated than what would be expected from the price and income effect. The links between fundamentals and price have been broken. The run-up in price of crude occurred during the initial period of the credit crisis. The price of crude was at $80 on October 1 of last year. This was after the credit crisis began and there already was talk of a recession in the US. The price of crude then increased by 55%. There was over a 40% increase sine the beginning of the year when data was showing a US slowdown. The price of crude was at $100 near the end off the first quarter which was even later in the US recession cycle. Current prices are still 15% above the year-end levels and 35% above the end of third quarter 2007 levels. The potential for further price declines is great even though crude inventory build-up is still less than expected; however, this still leaves an explanation for the 2008 run-up unclear. There can now be a stronger story for speculative excesses as investors moved money from equities to commodities during the first half of the year. The evidence of a global slowdown may be the key to the price decline, yet the quick shift in demand is surprising, 0ver 20% in less than a month. With Europe showing growth declines and inflation affecting Asian economic demand, the slide in oil may be just beginning. The European central bank held rates at 4.25 percent to continue its fight against inflation. They raised rates last month. This was within expectations and consistent with their focus on inflation. Inflation is above the target level and at the highest level in sixteen years; nevertheless, this inflation targeting is a dangerous game for anyone worried about economic growth. The numbers in European are showing a slowdown and a lack of confidence in the potential for growth. The equity markest in Europe have been much worse than the US given this tight money policy. The combination of higher energy costs and a strong euro which cuts into the key export sector has led to a business cycle that is more like the US. Additionally, there are areas in Europe which have seen a housing bubble. The credit issues of the US have been and will continue to be faced by many of the banks in Europe so lending activity will be tight over the next few quarters. We expect that business cycles in Europe and the US will move more in tandem. This means that that the euro will be generally have upward pressure given the higher interest rates relative to the US. The Fed is also likely to be on hold for what may be the remainder of the year so the interest differential between the two currency areas will stay range-bound.